So many gadolinium contrast agents are now available. What are the differences among them? At present, seven Gd-based contrast agents are commercially marketed and available in the United States, Europe, and Japan. Their brand names and general chemical characteristics are listed in the table below. Except for Eovist® (gadoxetate) having high (~50%) liver uptake, all are non-specific agents that distribute principally in the extracellular interstitial space. Note that in 2017 the use of some of these linear agents was suspended or restricted in the European Union (EU) due to concerns about potential free gadolinium toxicity. Additionally that year, production and distribution of two agents (Ablavar® and OptiMark®) were voluntarily terminated by their manufacturers and have been removed from previous versions of the table. The ionic radius of Gd+3 (108 pm) is very close to that of Ca+2 (114 pm). Free gadolinium is therefore a competitive inhibitor of physiologic processes that depend on Ca+2 influx, including voltage-gated calcium channels and the activity of some enzymes. All Gd-based MR contrast agents therefore use some sort of ligand to chelate (contain) the free ion and reduce its high toxicity. Structurally, gadolinium-containing contrast agents can be divided into two groups based on the type of ligand. Linear agents have an elongated organic molecular ligand that wraps around the ion. Macrocyclic agents form a cage-like ligand structure with the ion trapped in a preformed central cavity. Both linear and macrocyclic agents can either be ionic or non-ionic. 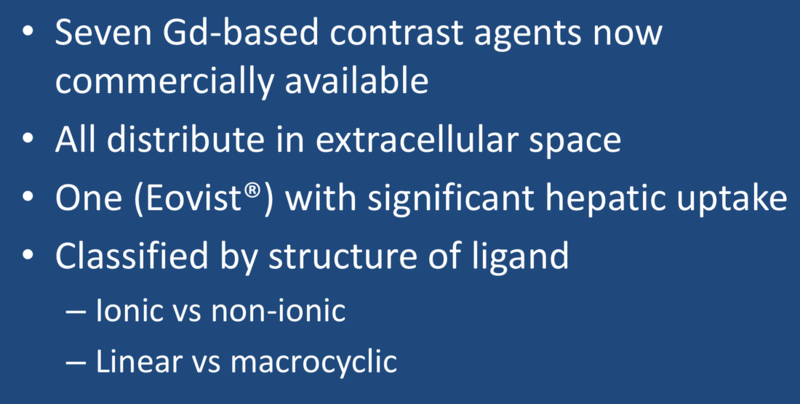 The following video may be helpful in further illustrating the differences between linear and macrocyclic contrast agents. More details about these various agents can be found in later Q&As. Below are a set of links to the pharmaceutical web sites and pdfs of prescribing information/package inserts (accurate as of 1 Feb 18). Before using any of these agents please check for updates and warnings directly from the manufacturer. In 2017 GE Healthcare began marketing Clariscan™, a generic form of gadoterate, in Europe and Asia, as the patent for Guerbet's Dotarem had expired. (Note that Clariscan has the same name but should not be confused with as a ferrite-containing contrast agent developed by Amersham in 2000 that was never marketed). Bellin M-F, Van Der Molen AJ. Extracellular gadolinium-based contrast media: an overview. Eur J Radiol 2008; 66:160-167.
de Haën C. Conception of the first magnetic resonance imaging contrast agents: a brief history. Top Magn Reson Imag 2001; 12:221-230. European Medicines Agency. Final opinion restricting use of linear gadolinium agents. 23 Nov 2017. Rohrer M, Bauer H, Mintorovitch J et al. Comparison of magnetic properties of MRI contrast media solutions a different magnetic field strengths. Invest Radiol 2005; 40:715-724. 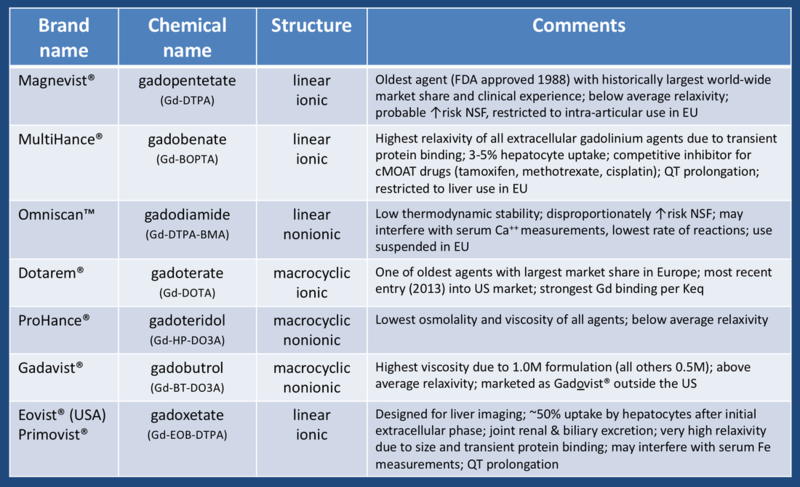 Are non-ionic gadolinium contrast agents better than ionic ones? What are the important physical properties to consider when choosing a contrast agent?